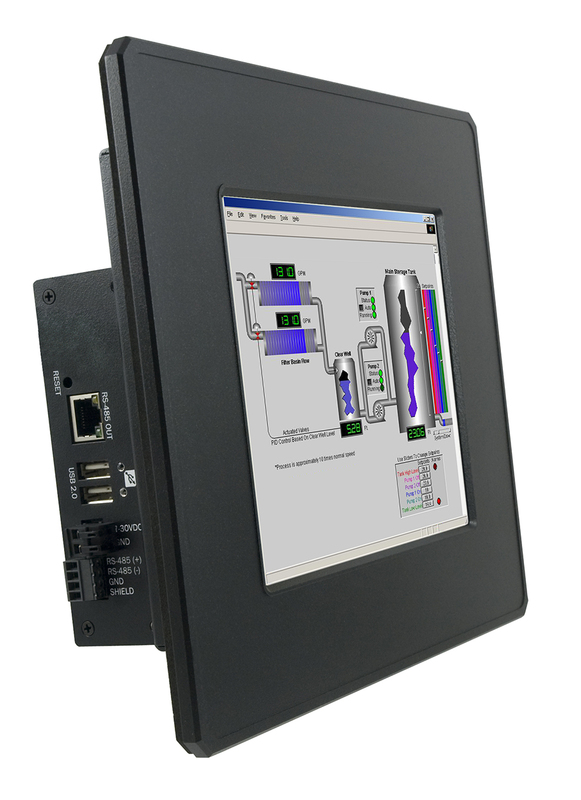 The SeaPAC R9-8.4 combines a powerful RISC-based embedded computer with a bright 8.4” TFT LCD to create a wide-temperature, ruggedized, flat panel computer perfect for a variety of HMI and control applications. 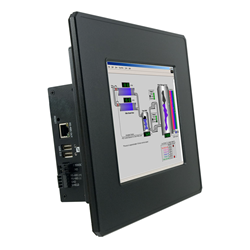 The SeaPAC R9-8.4 combines a powerful RISC-based embedded computer with a bright 8.4” TFT LCD to create a wide-temperature, ruggedized, flat panel computer perfect for a variety of HMI and control applications. Featuring LED backlight technology, the system offers an impressive extended operating temperature range of -30° to +70°C with no heaters or cooling fans required. Powered by a 400 MHz ARM9 microprocessor, the SeaPAC R9-8.4 is available with 128MB RAM and 256MB Flash memory for maximum performance in embedded systems. Standard I/O includes Ethernet, serial, USB, and digital interfaces. For intuitive operator interface, the system includes a resistive touchscreen that is suitable for a wide range of industrial environments and applications. The SeaPAC R9-8.4 is intended for panel mounting and provides NEMA 4/IP65 protection from sprayed liquids. Local or remote I/O expansion is available using Sealevel SeaI/O modules. Choose from a variety of I/O configurations including optically isolated inputs, Reed and Form C relay outputs, TTL interfaces, A/D, and D/A. The SeaPAC R9-8.4 connects to SeaI/O modules via the system's RS-485 expansion port and communicates using Modbus RTU. To provide the fastest time to market, the Windows CE 6.0 BSP binary and low-level drivers for system I/O are included. Additionally, the SeaPAC R9-8.4 software package is equipped with the Sealevel Talos I/O Framework, which offers a high-level object-oriented .NET Compact Framework (CF) device interface. This interface provides an I/O point abstraction layer with built-in support for easily interfacing the system’s I/O. Linux support is also available. The SeaPAC R9-8.4 (Item# S95100-8R) is available from $1,599.00 in low quantities. Sealevel Systems, founded in 1986, provides industrial computing solutions in addition to a variety of communications and I/O products including PCI Express and PCI Bus cards, Ethernet serial servers, and USB serial adapters. The product line includes multi-port RS-232, RS-422/485, RS-232/422/485 multi-interface high-speed sync/async, and digital/relay I/O. For more information visit http://www.sealevel.com or call 864-843-4343.